I am stress baking these days. The state of the world has me feeling anxious and at times, hopeless. In moments like these, I do one of two things: I clean or I bake. That plus a long run usually helps me sort things out, but even that isn't working as it normally does. I've made 5 batches of tahini blondies in the last 10 days. I give them out to the kind folks who work in my building, because sharing food gives me comfort (and also because it would be dangerous to have so many batches in my house). I don't know what to do to feel better about our future, but I am staying informed because knowledge is power. 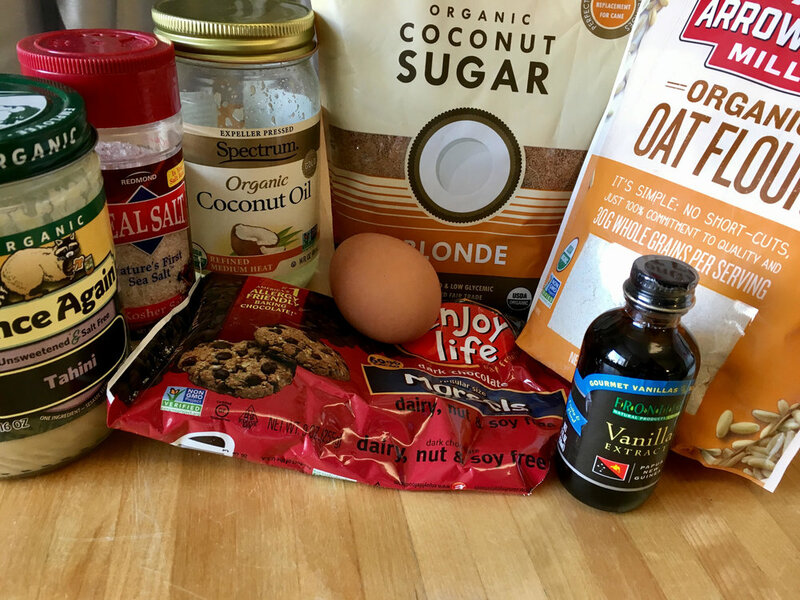 In the meantime, I'm sharing my recipe for Tahini Blondies with you. It checks a lot of boxes: it's nut free, dairy free and gluten free, it's an uncomplicated recipe and it's an absolutely delicious sweet treat. I've been making them into little hearts in anticipation of Valentine's Day, but also because we all could use a little love right now. If you don't need these to be gluten free, you can of course make these with wheat flour. And if you don't want to get coconut sugar, you can use brown sugar instead, but trust me when I tell you that the coconut sugar adds a whole new dimension of flavor to these delights. I've used dairy free chocolate chips, but if dairy free isn't necessary for you, you can use regular chips. I've also added these to our LaLa Lunchbox Food Library, so my kids can choose them for lunches. Download the app for free today, and all you have to do is snap a photo of these and add them to your LaLa Library via Settings! Preheat the oven to 350 degrees F. Combine all ingredients except the chocolate chips. Mix until smooth and then add the chocolate chips. Line an 8x8 baking tray with parchment paper and grease with coconut oil or vegetable oil. Pour the batter in and bake for 22-24 minutes. Cut into little squares and enjoy either hot or cool. If you make these into little hearts, adjust the baking time to approximately 15 minutes. These are a perfect treat for the lunchbox too! Want more lunchbox inspiration? Head over to Instagram where we post daily! Do you love using LaLa Lunchbox? Let us know via email or by tagging us on Instagram or Facebook!